Thiruvananthapuram is the southernmost district and the capital of Kerala, the God’s own country. One who visits Thiruvananthapuram visits a heaven experiencing the ecstasy of being here. Travancore and Kochi were two princely states while Malabar was a province of Madras. It was in 1956 that these three territories were put together and made into the state of Kerala with Thiruvananthapuram, the remote south, being her capital. Thiruvananthapuram is enveloped by the Arabian Sea in the West, Nagarkovil and Kanyakumari of Tamilnadu in the East and South respectively and Kollam in the North. The wooded highlands in the Western Ghats in the eastern and northeastern borders give Thiruvananthapuram some of the most enchanting picnic spots. A long flash/Kerala wild life-kerala kerala-things to do-kerala tourism-wild life sanctuary-wild life sanctuaries-wild life conservation-animals-nature-birds-wildlife-things to do-hotels in in with internationally renowned beaches, historic places, backwater stretches and a rich cultural heritage make this district a much sought after tourist destination. Thiruvananthapuram which got this name from Anantha, the serpent king of Hindu mythology has three major rivers, namely Neyyar, Karamana and Vamanapuram. Rich with greenery backwaters of Veli, Kadinamkulam, Anchuthengu and Edava Nadayara canals Thiruvananthapuram gives a heavenly experience. Traditional buildings and monuments stand as great examples of culture and overwhelming splendour. Air: Trivandrum International Airport (6 km from the city), Ph: 0471 2501220. Rail: From the central railway station there are direct trains to all the main towns. Thampanoor Railway station, Ph: 2321568. Road: Long distance buses operate from the Central Bus Station, Thampanoor, Ph: 0471 2323886. Napier Museum: Napier Museum is a reservoir of bronze idols, historical ornaments, ivory carvings, temple chariot and other archeological treasures. Built in the 19th century, Napier Museum is a perfect example of Indo-Saracenic structure. Kerala State Science and Technology Museum: The museum which has more than 350 attractions on science and technology was established in 1984. A children’s science park is also added to the museum in 1997. Natural History Museum: The Natural History Museum is housed in a modern building at an elevated ground at the eastern end of the Museum and Zoo complex, Thiruvananthapuram. The varied and rich collections in Natural History which started with the personnel collection of minerals and books presented by General Cullen in 1885 has found satisfactory housing in this new building in 1964. Chacha Nehru Children’s Museum: Chacha Nehru Children’s Museum is named after Pandit Jawaharlal Nehru who was the first Prime Minister of India and a great lover of children. Chacha Nehru Children’s Museum which established in 1980 displays a vast collection of dolls, stamps and masks from all over the world. Observatory: The observatory which is situated 60 meters above sea level in one of the oldest in India. Located near museum from here one can get a bird’s eye view of the city. K.C.S. Panicker’s Gallery: Established in the year 1979 a gallery solely dedicated to the paintings of contemporary Indian art of K.C.S. Panicker who is nominated as one of the nine eminent artists in India. Vyloppilly Sanskriti Bhavan: It was opened in 2001 in memory of great Malayalam poet Vyloppilly Sreedharamenon. The bhavan is attractive with its Padipura and Koothambalam which have wooden flooring and distinctive lamps. Kuthiramalika (Puthenmalika) Palace Museum:Kuthiramalika Palace was built by Maharaja Swathi Thirunal Balarama Varma who was a versatile genius. The annual Swati music festival is held here. Kuthiramalika Palace is a rare specimen of artistry in the traditional Travancore style of architecture and also contains splendid wood carvings. Kuthiramalika Palace Museum displays rich paintings and several priceless collections of the royal family and is located very near to Sree Padmanabha temple. Priyadarsini Planetarium: Priyadarsini Planetarium offers extensive insight into the mysteries of the universe, the planets and the galaxies. Sree Chithra Art Gallery:Sree Chithra Art Gallery is near to Napier Museum. A good collection of original paintings of Raja Ravi Varma, the piccasso of Kerala, Svetlova and Nicholas Roerich are the real treasures preserved here. Copies of Rajput, Mughals and Tanjore schools of arts and painting of Ajantha Caves, collections of eastern paintings from China, Japan, Tibet and Bali are also exhibited. Sankhumukham Beach:Sankhumukham beach adjacent to the airport is a lovely beach which attracts many people, particularly during the evening time. An indoor recreation club, the matsyakanyaka and a restaurant shaped like a star fish are some of the attractions here. Padmanabha Swamy Temple: Only Hindus are allowed inside the temple. Located inside the East Fort, this Vaishnava temple is very famous in India attracting countless devotees from all parts. Dedicated to Lord Vishnu sleeping on Anantha, the Serpent King, Padmanabha Swamy Temple is a rare blend of Dravidian architecture and the Kerala style. Padmanabha Swamy Temple is also known for its murals and stone carvings. Secretariat: This is centre of administration of Kerala Government. The building is the best example of Roman Architectural style. Varkala: (40 km from Thiruvananthapuram) Varkala is a religious, spiritual, pilgrim and tourist spot. It is at Sivagiri, a hill top near Varkala that Sree Narayana Guru, is laid to eternal Samadhi. High cliffs with mineral springs rise majestically from the coast line of Varkala. The Papanasam beach here is very famous. It is believed that anyone who takes a bathe here will be relieved of all his sins. The 2000 year old Sree Janardhana Swamy Temple, a century old tunnel and Nature Cure Centre are also other attractions here. Sivagiri Mutt: The Sivagiri Mutt is an Ashram founded by the great Hindu reformer and philosopher, Sree Narayana Guru. The Guru breathed his last here in 1928 AD. The Sivagiri pilgrimage is conducted in between December 30 and January 1. Rock Cut Cave Temple: (17 km from Thiruvananthapuram) There are rock cut sculptures of the 18th century in the cave temple Vizhinjam. The granite cave envelops a one-celled shrine with a sculpture of Vinandhara Dakshinamurthi. The outer wall of the cave depicts half complete relics of the Hindu God Siva and Goddess Parvathi. Chowara: (8 km south of Kovalam) This fishing hamlet near to Kovalam has many picturesque spots. 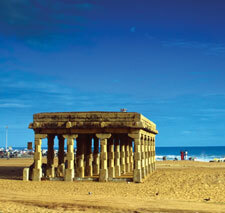 The Chowara Ayyappa Temple atop a hill overlooks the beach and offers an amazing view of the beach. Chowara is also home to the ancient Amalothbhava Matha Church. Poovar: (12 km South of Kovalam) An isolated but spectacular beach, Poovar is situated close to the Neyyar River estuary. A trading port in its early days, Poovar is today an important tourist destination. Akkulam Lake and Tourist Village: (12 km from the city) This is the another interesting picnic spot with natural splendour. Boating facilities are available here. The children’s park here is one of the biggest in the state. Veli Tourist Village: (9 km from the city) Veli tourist village, situated by the sea side, is an exotic picnic spot. The gardens and the lovely wading pools are very fascinating. One can avail the benefit of boating and water sports in the lake here. Sree Chithra Enclave: Sree Chithra Enclave was opened in 1993 in memory of Sree Chithira Thirunal Balarama Varma who was the last Maharaja of Travancore royal family. The evolution and geographical-socio-cultural history of Travancore State are explained with the help of audio-visual presentation. The belongings and artifacts of royal family are also exhibited here. Kanakakkunnu Palace: Kanakakkunnu Palace is a great museum showing glorious history and tradition of Kerala. Now, the palace and its premises are also venues for many cultural meets and programmes. Kovalam: The Kovalam beach is a paradise and all experience golden moments in this world renowned beach. Idyllic and dreamy, this sea-shore village was very tranquil and deserted once, except the fact that it was a fishing center. Today it has been printed with golden letters in the history of world tourism, drawn in golden ink in the world map of tourism. Thousands of tourists from all parts of Europe, England, USA and elsewhere throng into Kovalam every year to enjoy the unforeseen experience. Kovalam consists of two palm fringed cover, Light-house beach and Hawah beach, separated into north and south by rocky headlands. Padmanabhapuram Palace: (52 km from the city) Padmanabhapuram Palace was once the seat of the erstwhile rulers of Travancore. This superbly built palace with teak, granite etc stands within the massive stone town walls that kept Tipu Sultan unable to invade. The architecture is a class apart, unbelievable for the current day architects. Thiruvallam: (10 km from Thiruvananthapuram) A temple dedicated to Saint Parasurama situated here and it is a famous pilgrim centre for Hindus. The Kerala Film Development Corporation’s studio, Chithranjali, exists here. Thiruvallam is also a serene, sapphire like backwater stretched on the way to Kovalam and famous for its canoe rides. Zoological Garden: Thiruvananthapuram Zoo, one of the oldest in the country, was established as an annex to the Museum in 1857 by the erstwhile Maharaja of Travancore in order to attract more visitors. This Zoo was originally set up for recreational purpose only. But with more and more loss of forest and wildlife in the process of human development, the goal of the Zoo changed from recreation to conservation. Spread over in 55 acres of land located in the heart of the temple city of Thiruvananthapuram, the Zoo offers a rare opportunity for the visitors to experience and enjoy unparalleled picturesque and panoramic sylvan surroundings besides vivid animal collections. Peppara Wildlife Sanctuary: (50 km from Thiruvananthapuram) With its astoundingly beautiful flora and fauna and dotted with hillocks Peppara is emerging as a great attraction for wildlife adventurers. Peppara is also famous for its eucalyptus plantations. This attractive sanctuary is on the way to Ponmudi and spread over 53 km on the Western Ghats. Aruvi Waterfalls: (60 km from Thiruvananthapuram) Aruvi Waterfalls is an unspoiled tourist spot with 4 feet cascade. One can reach here only through trekking. Vizhinjam: Hardly 1 km away from Kovalam and 17 km away from the city lays the tiny fishing village of Vizhinjam, a sobering contradiction to the excesses of Kovalam. Vizhinjam is a big artificial harbour. Ponmudi: (61 km from Thiruvananthapuram) Ponmudi is located at a height of 915 meters above sea level. Ponmudi is an idyllic hill resort with tiny, winding pathways and cool, green, wooded environs. Agasthyakoodam:Agasthyakoodam is the second highest peak in Kerala which has a height of 1900 meters above sea level. Blessed with a lively wildlife, the forest of Agasthyakoodam is an abode of rare medicinal herbs and plants. A paradise for the bird watchers, Agasthyakoodam is accessible by foot from Kottoor, near Neyyar Dam, as also from Bonacaud. Aruvikkara Dam and Devi Temple:(16 km from Thiruvananthapuram) This picturesque picnic spot associated with the blessed name of Sree Narayana Guru, the greatest social reformer our time has witnessed, is on the bank of Karamana River. There is a stream full of fish that fearlessly come close to the shore to be fed by the visitors. Kowdiyar Palace: Kowdiyar Palace was the residence of the late Maharaja Sree Chithira Thirunal Bala Rama Varma and his family. The visitors are not allowed inside the palace. Neyyar Dam: (32 km from Thiruvananthapuram) A popular picnic spot, Neyyar Dam has a watch tower, crocodile farm, lion safari park and deer park. Boating facilities are available at the reservoir. Koyikkal Palace: (18 km from Thiruvananthapuram) Located on the way to Ponmudi Hill station and the Courtallam waterfalls, Koyikkal Palace is a representative of traditional Nalukettu, the typical old Kerala architecture. This ancient palace dates back to the 15th century. The Folklore Museum set up in 1992 is a treasure house of quaint musical instruments, occupational implements, household utensils, models of folk arts etc. Attukal Sree Bhagavathy Temple: The Attukal Sree Bhagavathy Temple one of the ancient temples of South India, is popularly known as Sabarimala of Women. The Goddess in the Temple is worshipped as the Supreme Mother, creater of all living beings and the mighty preserver as well as destroyer of them all. Santhigiri Ashram: As the name implies, Santhigiri has developed as a mountain of peace. Also it has become a fountain of love and mercy to all people, irrespective of the differences and discriminations of caste, creed, colour, community, culture or country.